Mike Moreu | Something should go here, maybe later. I always think Tremain was the best cartoonist I’ve ever seen – he always seems to take the view of the “everyman”, poking from well established public perceptions in a way that made you chuckle even if you supported the party being lampooned. Mike Moreu on the other hand, tends to slant his cartoons towards his own personal political views, which is a pity, because he’s a very good artist. However, he’s got one today that we can all chuckle at. From Family First’s weekly email. A few weeks ago, Mike Moreu published what amounts to libel of Family First. So someone wrote Family First an alternative. Just as unfair and untruthful. I wonder if he likes it? 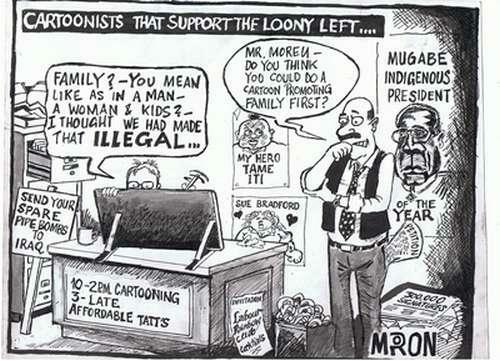 Mike Moreu is a great artist, but he doesn’t get it sometimes. Sorry Mike, but that’s the opposite of what Labour is doing. Yes, I know it’s hard to believe but they are in fact suggesting less regulation – for once! Let’s hope it’s the start of a trend, and that the ones to continue it are John Key and Bill English.